So here's my problem with Spanish restaurants in London. Portion size and the misconception of tapas. Tapas are small snack-sized tasters that accompany a glass of beer or aperitif and are usually free or around the euro mark. Groups of people sharing a melange of larger portions of food; these are called Raciones (rations), which are anything between €5-€9 and usually plenty to satisfy at least 4 people. Under no circumstance would you have a Spanish person paying £4.90 for a slice of potato omelette or share a "tapa" of 5 squid rings for £5.70, which is a common occurrence in London and is the case at new Brixton eatery Boqueria. Named after renowned food market in Barcelona, Mercat de la Boqueria, this new haunt is riding high on the Brixton gentrification wave, kick-started by pizzeria Franco Manca and the subsequent rejuvenation of Brixton Village. I know you can't compare the cost of a particular cuisine in London to what you'd pay in its original country, but I really feel that there's always an uncharacteristic pretentiousness attached to Spanish food which completely defeats the whole object of it. That being said, I do give the actual menu at Boqueria 10/10 for authenticity of its dishes, so you won't find a confused chicken satay skewer being labelled as Spanish or sausage du jour, chorizo, appearing in your paella. Here, you'll find a mix of the unfamiliar, such as succulent pork cheeks (carrillada ibérica) as well as staple favourites like the aforementioned fried squid cooked to non rubbery perfection and delicious iberico ham infused croquettes. 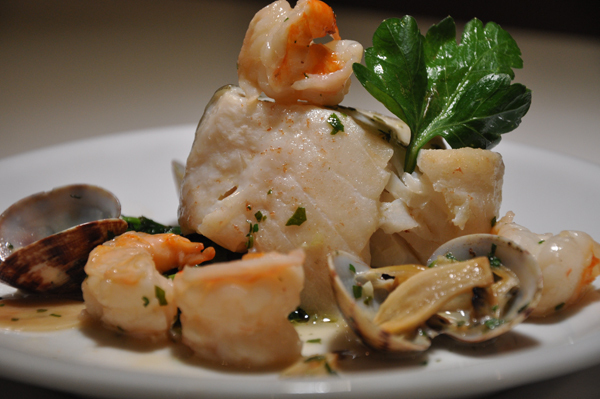 The merluza en salsa verde, filet of hake served with prawns & mussels, is exquisite; shame there wasn't more of it! Normally served as a main meal in its motherland, here it is a starter type portion at £7.90, so you might want to order two. There are also forays into slightly more inventive territory, such as the suckling pig being dished up with parsnip, sweet potato crisps, apple sauce and lemon sorbet; around 3 more ingredients than is usually found on a Spanish plate but a refreshing change nevertheless. Dessert time, not usually a forte of Spanish food, is also given a good go here with an array of traditional cheeses served typically with quince jelly (membrillo) and a great selection of sherries on hand to accompany them. Although it doesn't quite live up to TimeOut's winner of "cheap eats" of 2012 nor the "genuine tapas experience" it labels itself as, Boqueria, is definitely a vast improvement on other Spanish grub available in the capital with truly Spanish dishes, delicately prepared, using fantastically fresh ingredients. A sherry good time. Sorry.